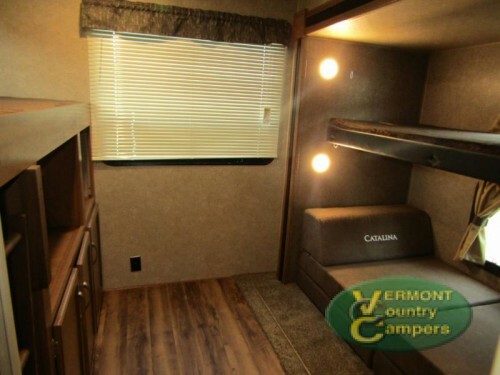 Take a look inside our Coachmen Catalina Legacy Travel Trailers! The Catalina Legacy floorplans feature anywhere from one to three slide out with enough space to sleep up to nine people. 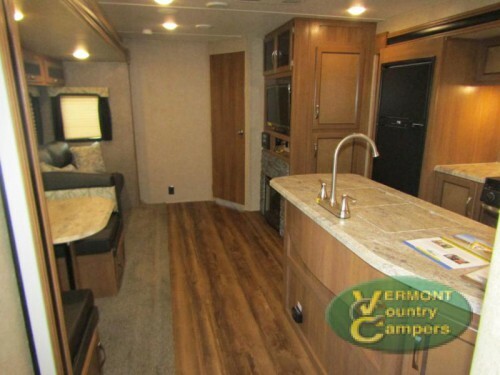 With convertible furniture, a queen master bed, and models with a set of double bunks or a separate bunkhouse, everyone will have their own space to sleep whether your family is large or small. Bring along the entire family in the bunkhouse models! Bringing along a lot of people will require you to have more space for their belongings. In this Coachmen Catalina, there will be storage space located throughout the interior. For example, in the kitchen, you’ll have access to many overhead cabinets and drawers for all your utensils including a large pot and pan drawer and a silverware drawer. In the master bedroom, you will have a huge under bed storage space with easy lift gas struts as well as a set of dual shirt closets. You’ll love all of the interior storage space. The temperature of your travel trailer will be essential to everyone’s comfort. The combination of the auto-ignition furnace, residential in-floor ducted heat, air conditioning unit, and fireplace found in many of these models will ensure that the interior is always at the temperature you want without any trouble. Cook for everyone with multiple kitchens. Cooking for larger groups will be easy in the Legacy travel trailer. The main interior kitchen will come with all stainless steel appliances in the Legacy Edition Package including a gas and electric double door refrigerator. 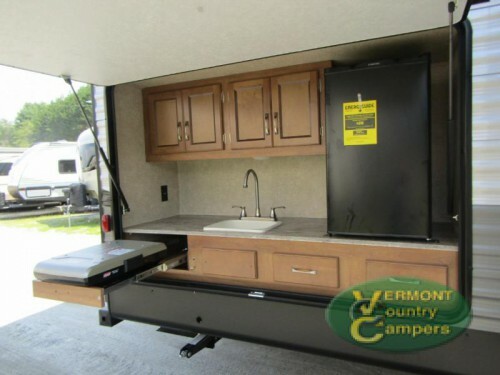 Plus, you can add on an optional, exterior pull out kitchen with fridge, single sink, and Coleman cooking grill to provide you with another space for cooking and enjoying the outdoors. 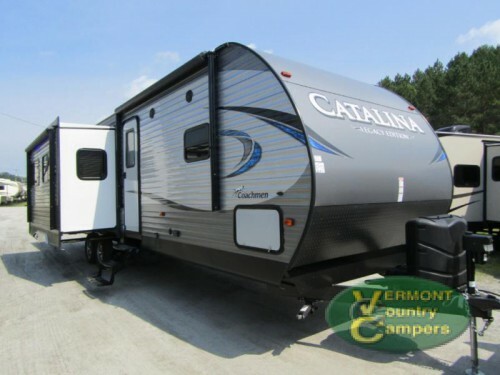 Taking the entire family along will be so easy in our Coachmen Catalina Legacy travel trailers. To learn more about this family friendly RV, you can simply contact us or stop by our location today! We would love to give you a tour of these and any of our other travel trailers for sale to make sure you get the perfect model for you!